You’ve got to check out the fun, walkable and friendly Electric City. Park the car. Hit the pavement. Discover why everyone is talking about this downtown on the rise. 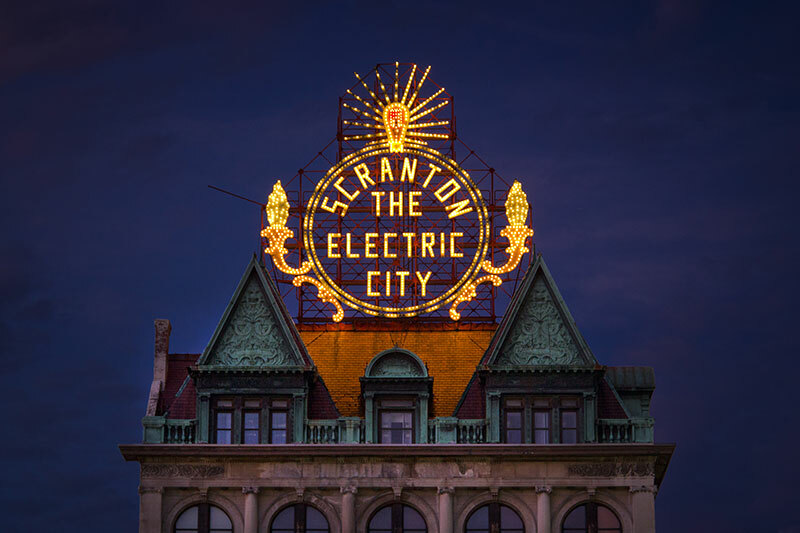 When was the last time you visited Downtown Scranton? Maybe you drop in every year for the Saint Paddy’s Day Parade or La Festa Italiana. Perhaps you shoot in for an occasional quick dinner and leave. If that’s the case, you have no idea what you’re missing. You only need one day to fully grasp all that this beautiful, historic downtown has to offer. Still skeptical? Let us walk you through it. For those who enjoy the exercise, walking is the best way to explore Downtown Scranton. You can park the car at nearly a dozen pay-to-park lots, or convenient metered spots around the city. If you want to be near the center of it all look for a place close to Courthouse Square. If you’re a fan of classic architecture or industrial age design, Downtown Scranton is where you want to be. You can’t miss the stunning, Victorian Gothic, Lackawanna County Courthouse building. Take your time. 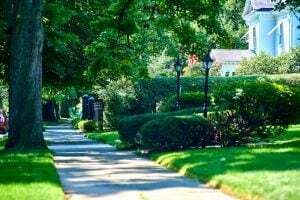 Walk the grounds and stop at all of the statues and historical monuments along the way. 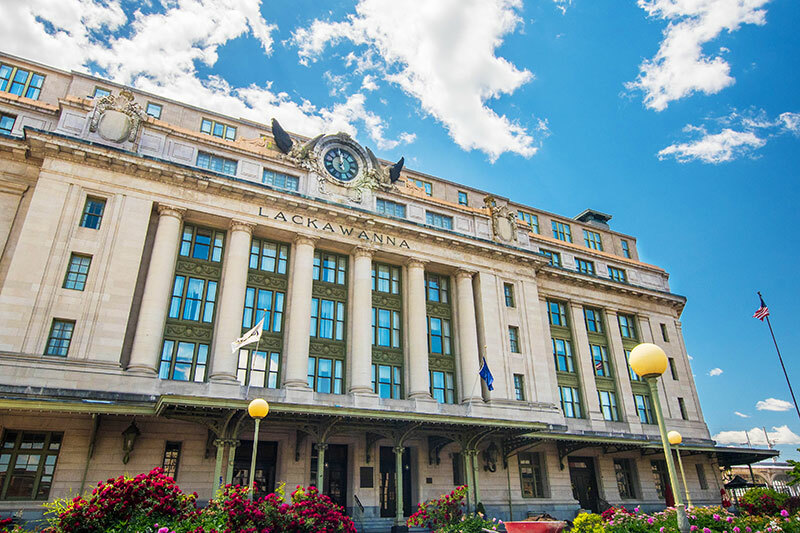 About two blocks south of Courthouse Square, you’ll find the famous Radisson Lackawanna Station Hotel. This turn-of-the-century, Neoclassical train station turned hotel, has become one of NEPA’s architectural marvels. The interior is just as amazing as the exterior. Do yourself a favor. 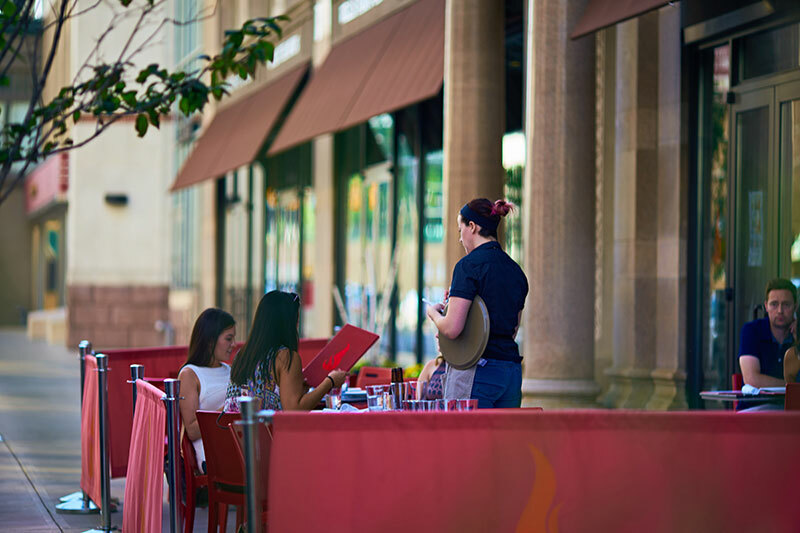 Reserve a table for lunch or dinner at Carmen’s 2.0, or Trax Bar + Kitchen and see for yourself. Don’t stop there. Downtown Scranton features many more beautiful buildings, historic sites and natural artistry. Something’s happening in this town. Cool, new businesses are popping up every day. People are getting out and going downtown. There’s a certain excitement whispering its way through the busy streets and alleys. 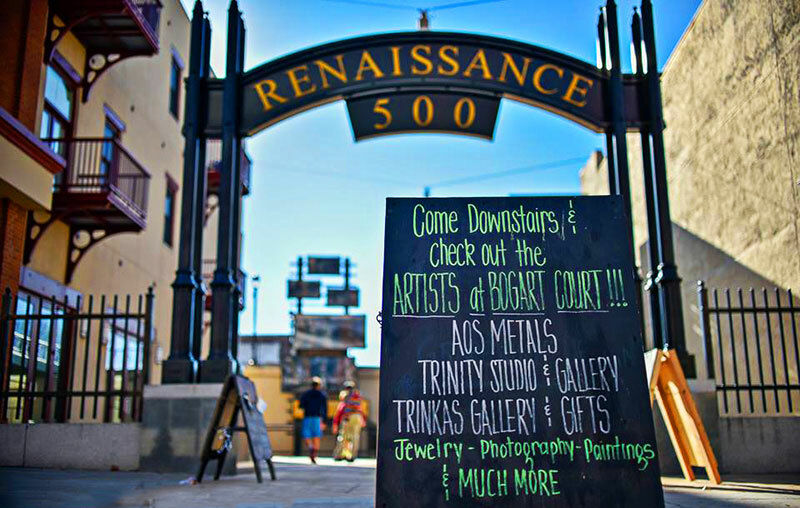 Speaking of alleys, you have to add Bogart Court to your list of Downtown stops. It’s a funky, little Bohemian strip of boutique stores and galleries. Of course, if you’d rather get all your shopping done in one stop, check out all the stores in the Marketplace at Steamtown. Just be sure to save room for lunch at the Scranton Public Market. Whether you’re looking for gifts, essentials or just spoiling yourself, it’s very likely that one of Downtown Scranton’s many shops has just what you need. This town is serious about its food. From fine dining to a quick, hot dog lunch to cold beers and live music, the food and entertainment scene in Downtown Scranton is world class. In a region known for its ability to absorb cultures through its food, Scranton has no shortage of unique dining options. Enjoy a classic American breakfast at City Market & Café, a Kosher lunch at Abe’s and a spicy dinner at Thai Rak Thai all in the same day. Maybe you just want a good old burger and a beer. Stop by Levels Bar & Grill just off the square. You can even hang around for when the third-floor nightclub fires up. Be a hero. Create an unforgettable date night by booking a reservation at Posh. From the historic setting and sophisticated décor to the service and remarkable presentation, you’ll leave this place dreaming of your next visit. Eat on the cheap, indulge and treat yourself or just grab a tasty, hot cup of coffee. You won’t go hungry in this town. 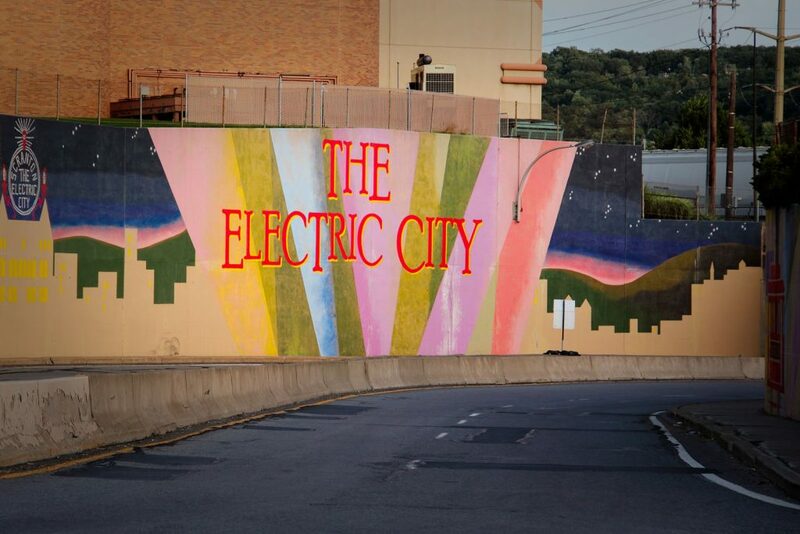 Document your visit to bustling Downtown Scranton by snapping a few Insta-worthy pics. Hit the must sees like Nay Aug Gorge, Courthouse Square, the Iron Furnaces and that welcoming Scranton Mural. And of course, you have to take a selfie with the world-famous Electric City Sign. Quick Tip: the best place to get a photo of that sign is by the Columbus statue at the corner of Spruce St. and N. Washington Ave.
And, as always, share your pics with us on social media using #DiscoverNEPA.